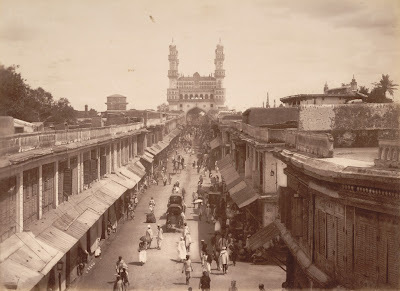 Photograph of a main street in Hyderabad, looking towards the Char Minar, taken by Deen Dayal in the 1880s. This is from the Curzon Collection: 'Views of HH the Nizam's Dominions, Hyderabad, Deccan, 1892'. Hyderabad was founded beside the River Musi in 1591 by Muhammad Quli Qutb Shah (r.1580-1612) as an alternative to his capital at Golconda. The town was laid out in a grid pattern with two main roads running east to west and north to south; the Char Minar sits at the intersection of these two roads. The Char Minar, or Four Towers, was built in 1591 to mark the centre of the city. This ceremonial structure comprises four imposing arched portals with arcaded storeys and geometric screens above. The four corner minarets are crowned with domical finials. They contain spiral staircases opening onto triple tiers of balconies.